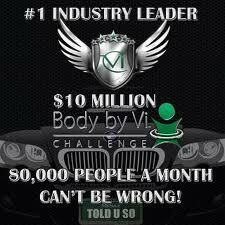 Welcome to the 90 Day Challenge with Body By Vi. The Vi-Shape Shake Mix that is the center of the diet is a highly nutritional supplement that will transform your body, your health and your lifestyle. Give it 90 days and you will see the results. Just by supplementing two meals per day with a tasty and nutritious Vi-Shape Shake will melt the pounds off of your body. The Vi-Shape Shake Mix blends well with just about any ingredient and the number of choices you can enjoy are endless. The Body By Vi system comes with many different flavors that combine with the Vi-Shape Shake Mix to keep you satisfied with new tastes everyday. Eat what you like (within reason) for your one meal of the day and you will still lose weight. This is not a fad or a gimmick. It’s a way of life!